With the advent of the sophistication of endodontic microsurgery, the endodontic-implant pendulum has reversed it’s swing. 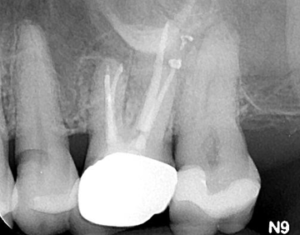 The patient presented to the office; her chief complaint was tooth #1.4 (2.6) which was slightly sensitive to percussion. 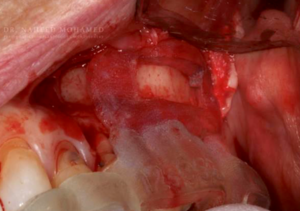 The overlying gingival tissues were inflamed and a recrudescent apical lesion was evident (Fig 1). 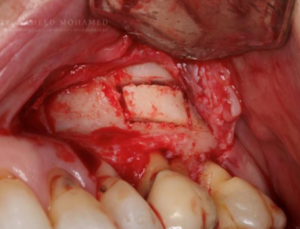 The patient was referred for a cbCT; the scan revealed a common area of rarefying osteitis surrounding the mesial buccal and distal buccal roots which had caused elevation of the sinus floor. 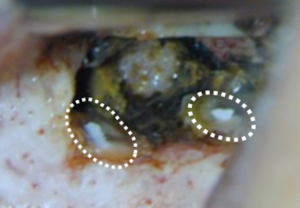 Endodontic pathology had not resolved from prior retreatment procedure (Fig 2). 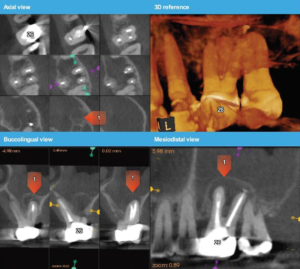 Various treatment options were proposed and the patient chose to have microsurgical therapy performed.A 3D printed stereolithic template was created by combining the cbCT scan with an intra-oral scan (Shape TRIOS® intraoral scanner) Fig 3. 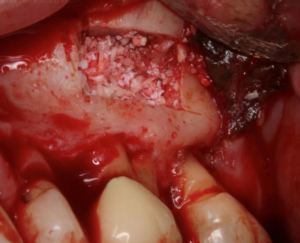 A guided microsurgical approach facilitates a flap design which minimizes the potential for sinus membrane perforation. 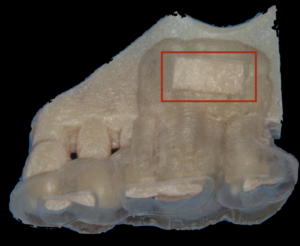 The apex of the cortical window was measured larger than the coronal level of the window, a height allowance of 4mm ensured a 3mm root resection and unimpeded use of ultrasonic tips for retro-preparation. 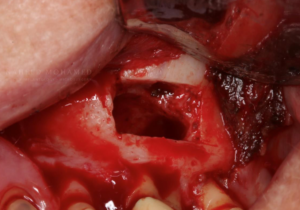 The surgical stent was placed over the maxillary teeth and a piezotome guided surgical window was developed using the margins of the stent (Fig 4). A chisel was used to elevate the cortical plate (Fig 5) and root resection performed with Lindeman burs (Fig 6). 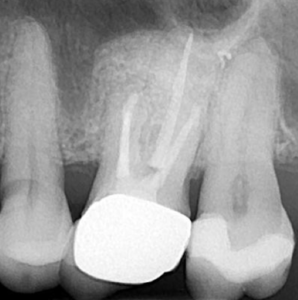 After resection (Lindemann burs – Brasseler USA®), the root periphery was stained with methylene blue and examined for anomalies (root-fractures, accessory canals, isthmi, gaps between the existing root-canal filling and the root-canal walls); the root canal space was retro-prepared with ultrasonic tips (Brasseler USA®) to a depth of 3 mm creating a reservoir for the retro sealing materials. The retro-preparation was filled with EDTA and dried with paper points. BC RRM-Fast Set Putty .3g Syringe (Brasseler USA®) (Fig 7) was placed in the retro-preparation, the root end burnished with a multi-fluted carbide bur (Brasseler USA®). The defect was grafted with allograft and xenograft (Fig 8) and the cortical window replaced. The re-evaluation radiograph taken at nine months (Fig 9) showed substantial osseous regeneration. Acknowledgement to Drs. Naheed Mohamed and Yosi Nahmias for their contribution.